Following the French atomic bomb tests in the South Pacific, an unknown creature is spotted passing eastward through the Panama Canal. Scientist Niko Tatopolous is called in to investigate the matter, and he quickly arrives at the conclusion that a giant, irradiated lizard has been created by the explosions. Godzilla then makes its way north, landing at Manhattan to begin wreaking havoc in the big city. 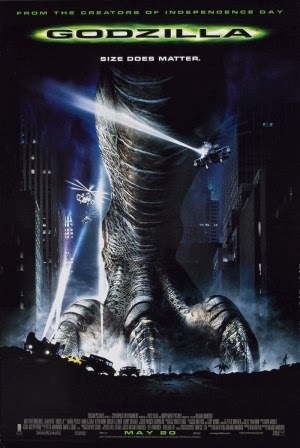 Because of the new release of Godzilla this year, and I’m looking forward to that, I watched this old blockbuster of 1998 once again. Well, it’s obviously an old movie in terms of CGI and the acting is sometimes hugely annoying and childish. Compared to the new movie this year it really looks miserable sometimes . On the other hand, I can still remember the original Godzilla movies I saw when I was young in an old movie theater on a Sunday afternoon . There was always some Bruce Lee movie programmed in conjunction with a Japanese Godzilla (vs. King Kong ) or a Bud Spencer/Terence Hill movie . The Japanese Godzilla was hilarious . It looked like a plastic figure between cardboard boxes with some terribly bad special effects . By comparison, this Godzilla is state-of-the-art . Lets have a look at Godzilla first. At times the images are quite good like for instance the underwater images. In most of the movie, we only see parts of Godzilla: a leg that is put down on some stationary taxis, a swishing tail or only his head. Not exactly high technology. What bothered me the most is the fact that the thump of the drop of a foot followed with the subsequently shock wave is not properly synced with the bounce of people and cars . I thought this happens with a bit delay. The fact that New York is turned into a ruin is one thing. The fact that the army is the main cause of this instead of Godzilla is another thing. It’s totally ridiculous. And sometimes I had the feeling that the decor was also made of cardboard boxes . The most irritating thing in Godzilla, are the stupid and terrible performances . I think Mathew Broderick is totally misplaced in this monster movie. I can tolerate him in a comedy like “She’s having a baby“, “Addicted to Love” or “Inspector Gadget “, but not in this monster movie . Or they used him to pump up the comedy-rate. His name Tatopoulus is already a reason to make some hilarious (sarcastic) jokes. All the time he runs around through the rain with that ridiculous hat and every time he says something it sounds implausible and totally made up . Maria Pitillo looks like an angel but is corny and predictable. She’s the blonde bimbo in the news department who’s not allowed to bring important news. Eventually she’s steals some footage on a tape and makes her own reportage. Her boss uses that for his own benefit but eventually she triumphs with a report at the end. She also appears to be an old sweetheart from Broderick. What a coincidence ! Hank Azaria (Victor ‘Animal’ Palotti) was actually the best actor. A nice guy at the right time to use the camera for exclusive images. Kind of weird that every time something like that happens, the camera doesn’t function properly. Then there are some more irritating people, such as: Kevin Dunn as a pedantic and clamorous Colonel, Michael Lerner as a stupid and thick mayor, Arabella Field as a friend of Animal who apparently doesn’t know a cameraman sometimes experiences dangerous situations. Her reaction is almost hysterical all the time. Then there’s Vicki Lewis the horny science woman who, despite the apocalyptic situation, still has time to start drooling whenever she looks at Broderick. And last but not least, Doug Savant as the most stupid soldier of the U.S. Army . The PeeWee Herman of the American army . You shouldn’t assume that this movie is accurate and realistic. If you seek that in a movie, go watch “The Butler”. But there are still quite a few things that look ridiculous . The fact that Godzilla was created by radioactive radiation by nuclear tests in French Polynesia, is actually a variant of the original film . Why this animal must swim all the way to Manhattan to lay her eggs, is a mystery to me. He/she swims from the Pacific Ocean through the Panama Canal, along Florida and then straight to New York . Is he/she making a tourist trip ? The pilots who control the helicopters apparently never had to do an IQ test. They are chased by Godzilla, look over their shoulders in a panic , knowing that if they just flew that thing straight up they would be safe . I also think their index finger got stuck with super glue to the firing mechanism , because they kept spraying bullets continuously even when there was nothing in their sight. And could they ever miss Godzilla ? Such a huge animal . Dr. Tatopoulus is a renowned researcher in the field of animal mutation by radiation. At the time he presents this as proof that Godzilla might be actually a mutant lizard ,everyone declared him as a total nutcase and crazy fruitcake. Why did they call upon him in the first place ? The end was somewhat entertaining with the “Jurasic Park”-like baby Godzillas . But overall it was a disappointment. “Godzilla” had no such effect as let’s say “Jaws “ or “King Kong”. Those movies gave you an anxious feeling. As someone suggested on IMDb : you purchase a lifelike Iguana as a pet, place it in the middle of the living room between some Lego houses, and observe how it moves and destroys everything. This can also be nerve-wracking and exciting.